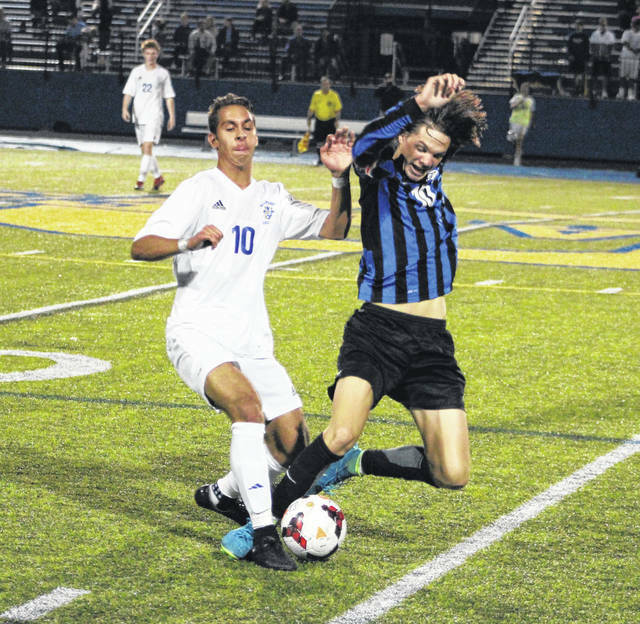 Olentangy’s Eli Stoner, left, and Liberty’s Colin McCort battle for possession during the first half of Tuesday’s OCC showdown in Lewis Center. Junior Nathan Rothert’s two first half goals paced the visiting Olentangy Liberty boys soccer team to a 3-0 win at rival Olentangy in OCC-Buckeye action Tuesday night in Lewis Center. Rothert broke a scoreless tie connecting on an Ean Dowell throw-in with 26:22 left in the first half to give the Patriots the only goal they needed. Colin McCort got one through the defense to Rothert, who dribbled right side and beat the goalie to push it to 2-0 with 0:53 left before halftime. Tyler Harris put one through in the midst of a pile in front of goal at the 36:09 mark of the second half to cap the scoring. Liberty (11-1-2, 4-0-1) clinched its first league title since 2014 (then as a member of the OCC-Central) in last Tuesday’s win over Westerville Central. The win is the ninth shutout of the season for the Patriots, who were at one point the No. 1 team in the country in the USA Today/United Soccer Coaches Super 25. Liberty is currently fourth ahead of 18th-ranked Dublin Coffman. The two teams meet in non-league action Saturday at 7:15 p.m. in Powell to close out the regular season. Meanwhile, Olentangy (8-2-5, 1-1-3) has quietly built a really solid season. The three goals given up Tuesday were the most the Braves have allowed in a single game this season. Liberty picked up its seventh straight win over Olentangy to move to 11-1-2 overall in the series. Olentangy hosts Big Walnut in non-league play Thursday at 7:15 p.m. to close out the regular season. The Patriots are the top seed and Olentangy is the eighth seed in the upcoming Central District Division-I tournament. Olentangy hosts 45th-seeded Marion Harding in the first round Oct. 18 and Liberty hosts either 32nd-seeded Central Crossing or 40th-seeded Whetstone in the second round Oct. 21.